FILE - South Sudanese rebel soldiers raise their weapons at a military camp in the capital Juba, South Sudan, April 7, 2016. Panelists testifying at a Senate subcommittee hearing this week strongly suggested a major U.S. policy shift on South Sudan. One expert described expelling South Sudanese diplomats as the kind of bold action needed if Washington wants to send a clear message to Juba. Only three of the 9 members of the Senate Foreign Relations subcommittee on Africa showed up for the hearing. A perturbed Senator Cory Booker, a Democrat from New Jersey, noted the lack of White House and State Department officials present at Wednesday's hearing. "It's my perspective that every month we wait for this administration to craft a policy and a strategy to deal with this issue is an absence of American leadership," Booker said. FILE - Sen. Cory Booker, D-N.J., questions Secretary of State-designate Rex Tillerson as he testifies on Capitol Hill in Washington, Jan. 11, 2017. Booker added that the monthlong congressional recess starting soon will further exacerbate efforts to address the political, economic and humanitarian chaos in South Sudan. 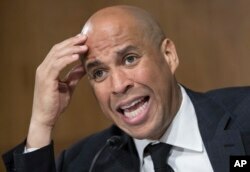 Booker also noted that key U.S. diplomatic positions remain vacant, such as assistant secretary of state for African affairs, and a U.S. special envoy for Sudan and South Sudan. Aly Verjee, a visiting expert at the United States Institute of Peace, agreed. "The U.S. ambassador in Juba [Mary Catherine Phee] is the senior official. And everybody knows that whatever she says does not come with any support of this administration because of the absences. She can say the United States does not accept this cease-fire violation and she can say that you must implement the peace agreement, but everybody in South Sudan knows there is nothing that backs her up," Verjee said. 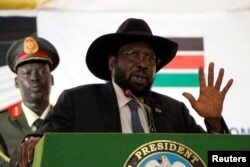 Joshua Meservey, a senior policy analyst for Africa and the Middle East at the Heritage Foundation in Washington, said aggressive symbolic gestures like expelling South Sudanese diplomats from the United States could send a strong message to Juba and challenge President Salva Kiir's leadership. "The Kiir regime, every time it sits across the table from a diplomat from the United States or Europe, derives a certain amount of legitimacy. No matter the statements we put out to the contrary, the mere fact that we speak to him and treat him as if he is part of the solution suggests that he is part of the solution. He is not. He is a profound part of the problem," Meservey said. Payton Knopf, coordinator for the South Sudan Senior Working Group at the United States Institute of Peace, said the Kiir administration in unquestionably an illegitimate regime. FILE - South Sudan's President Salva Kiir speaks in Juba, May 22, 2017. "It is incumbent on the United States, given the magnitude of the crimes that the regime has committed and continues to commit, to not undertake a business-as-usual approach to its diplomatic engagement," Knopf said. Knopf said the U.S. can send a very significant signal to neighboring governments and European partners by recognizing the Kiir government for what it is, "which is a brutal regime that continues to murder its people." Gordon Buay, deputy head of mission at the South Sudan Embassy in Washington, who attended the hearing, dismissed all statements questioning Kiir's legitimacy. "For somebody to say that President Salva Kiir, who was elected with 98 percent of vote of the people of South Sudan, is not legitimate, that person is from another planet," Buay said. The ongoing conflict has had dramatic consequences on South Sudan's humanitarian situation. The United Nations Office for the Coordination of Humanitarian Affairs asked for $1.6 billion for its response plan in South Sudan. Fifty-four percent of that amount has been met to assist in what has been called the world's fastest-growing refugee crisis.